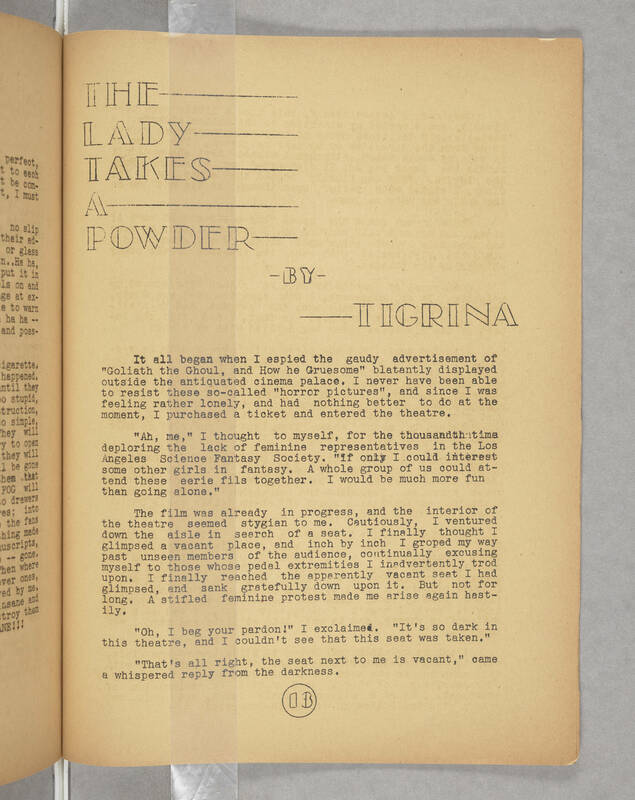 THE LADY TAKES A POWDER By TIGRINA It all began when I espied the gaudy advertisement of "Goliath the Ghoul, and How he Gruesome" blatantly displayed outside the antiquated cinema palace. I never have been able to resist these so-called "horror pictures", and since I was feeling rather lonely, and had nothing better to to do at the moment, I purchased a ticket and entered the theatre. "Ah, me," I thought to myself, for the thousandth time deploring the lack of feminine representatives in the Los Angeles Science Fantasy Society. "If only I could interest some other girls in fantasy. A whole group of us could attend these eerie fils together. I would be much more fun than going alone." The film was already in progress, and the interior of the theatre seemed stygian to me. Cautiously, I ventured down the aisle in search of a seat. I finally thought I glimpsed a vacant place, and inch by inch I groped my way past unseen members of the audience, continually excusing myself to those whose pedal extremities I inadvertently trod upon. I finally reached the apparently vacant seat I had glimpsed, and sank gratefully down upon it. But not for long. A stifled feminine protest made me arise again hastily. "Oh, I beg your pardon!" I exclaimed. "It's so dark in this theatre, and I couldn't see that this seat was taken." "That's all right, the seat next to me is vacant," came a whispered reply from the darkness.